Applications: For the removal of paint, varnish, rust, grime and other coatings. Commonly used for car body and coachwork repairs where it would be counter-productive to strip a large area. Will also provide a swirl brushed finish to stainless and hard alloys. Fits Lockit and Roloc compatible holders. Can be used on air-tools, drills and angle grinders with suitable holders. Product Notes: Stocked in 50 & 75mm diameter, this is an ideal way to work on localised repairs and small areas.. They do not easily load up with the stripped material. Fast working on metal. 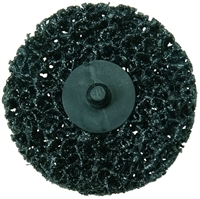 Also Available: For stripping larger areas we offer a range of stripping discs. We stock suitable backing pads with either 6mm spindles or M14 female threads.